Figure 1: Weather Fax (sky view). 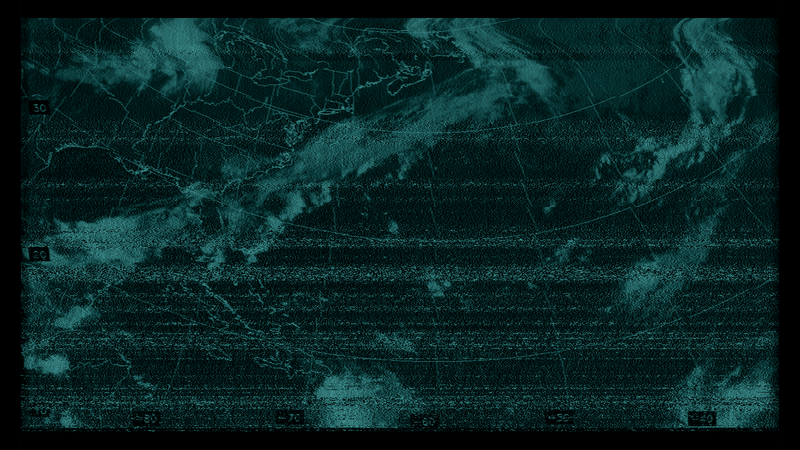 The weather fax in figure one was generated with a regular receiver (not the Soft66-Lite). It was color enhanced for visual effect (not obvious, I know). The regular receiver is not always able to make the perfect fax. A lot depends on the conditions. The Soft66-Lite uses an UPC1688 RF amplifier, with a 4 dB noise figure at 500 MHz, a high speed video amplifier (the 450 MHz OPA2356), a dual FET bus switch integrated circuit (SN74CB53306), a clock multiplier IC (ICS512M), and a quad input exclusive OR 74AC86 in addition to the linear regulator chip. They are repurposed, of course, and while not numerous, they have decent specs IMO. It’s amazing to me that such a small number of parts can operate at all, to generate any kind of weather fax. The magic is in the offload of the functionality to the software, of course. OK, so the bandpass filter that I’m using with the little SDR is wide as a barn door. I made it ~2 MHz wide for two reasons, FIrst, the 7.0 CF BPF that was supplied with the kit was ~3 MHz wide, and secondly – I wanted to be able to tune multiple (as many as possible) weather fax stations with one BPF. This is the kind of thinking one would use if one were working with a general coverage receiver, where one shortwave band could easily be 2 MHz. However; I’m thinking that I may build another more narrow BPF to help reduce the reception of unwanted stuff, and the creation of more related internal artifacts. This has the downside that I’ll have to swap out or switch out more BPF filters. Then, I got to thinking I could build a “receiver enhancer” box, so to put all the switching and whatnot in a separate enclosure, maybe making it about the same size as the sidecar SDR. I don’t want to use mechanical switches anymore, and if I use more, narrower BPFs I’ll not have the room in the box anyway. So, maybe an Arduino set up for a remote interface and BPF selector, controlled via an nRF24 transceiver, could make things less messy. Maybe I could route the audio over the nRF24, put batteries inside the sidecar, and get rid of all the wires! It’s a lovely circuit using a semi-modern FET (no, not really) – and a CATV NPN transistor, the former available on Mouser and other places for about fifty cents, and the latter for a couple bucks. It’d eat my batteries like candy. OK, so what about the DDS? Now, I’m collecting crystals like candy, and those will be a nightmare to switch in and out of my little sidecar. If I’ll have an Arduino for the nRF24, I can put it to use doing DDS as well. There’s a thought. So, all of the switching could be clean non-mechanical, including crystals and BPFs and preamps. Edit: Now I see a listing on Ebay for a Soft66-LC4 ($75). That may be a deal that makes much more sense than retrofitting a bunch of extra stuff ahead of the “lite” version. Note: the soft66 hardware is a product that is sold on a Japanese website (http://zao.jp/radio) – and is not affiliated with this site or author in any way.